Games are the best things and most of the users draw their attention on the internet. 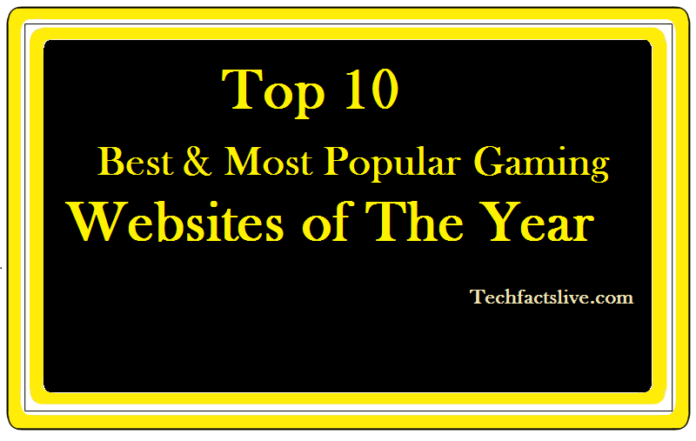 We are providing the Top 10 Best and Most Popular Gaming Websites in the year 2016. The calculation of these gaming websites which is visited most by the users and the trending sites are listed. You can also check the Global Alexa Rank estimated traffic for the respective websites. Now it’s time to go through the online gaming platform websites where most of the users are loved to visit. ROBLOX is the one of top most gaming website online gaming platform for the “gaming community.” This is a website for kids and teens. The users can create the games and can let others play in the online. So far 15 Million games have been created by more than 300,000 users generating highly creative and immersive experiences in the ROBLOX. The gamer can experience the 3D multi-player games and compete with the opponent (i.e. Friends) which they made on ROBLOX. You can also access from all mobile devices, computers and Xbox. ROBLOX “Powering Imagination” as their slogan and over six million explorers visits every month. ROBLOX creates adventurous gaming experience, role play, play games and learns with their friends. The Website Alexa Rank is 355 across the world and estimated web traffic is 72 Million monthly visitors. ROBLOX is the top and popular gaming website. BATTLE.NET was developed by the Blizzard Entertainment, the premier developer and the publisher in the entertainment software established in 1994. Within less time company became the most popular in making the computer games. Blizzard Entertainment has become supreme in creating the best and well-designed highly enjoyable experiences. The users can buy the games once they register on the Gaming Websites and you can also download the desktop application which is available on the site. BATTLE.NET engages more than 91.5 million monthly visits to the site. This Alexa rank of this gaming website Battle.net is 386. BATTLE.NET allows the users to download the BATTLE.NET Mobile Authenticator app from the Google Play store and the IOS app store. BATTLE.NET is the one of the top and popular gaming website. FRIV is the one of the top and popular gaming website on the internet. This is the best and safe place to play popular games. You can play many online games for free on this website. You can find different games like car games, puzzle games, boy’s games, girl’s games, dress up games and more. When you visit the FRIV website, all the games are listed in a unique style. All the available games are listed in small tiles displayed with the icon of the game. You are just one click away from playing the online games for free. There is no need for registering in the FRIV website for playing the games, and direct access is provided. FRIV provides the different games like Baseball, Boom, Pac-xon deluxe, Ninja Shape, Fire catcher, Dynamite Tram, etc. FRIV is the one of the top and popular gaming website holding the global Alexa rank with 428. The user visit and the user engagement for this website are good and high. Every month total visits are nearly 133 million users. Y8 is another top and popular gaming website more than 50000 games can play at the Y8.com website. The users can play the games with registration in the Y8 website and can also play without login into the site. But if you are registered user your scores are calculated and also you can compete for the leaderboard positions. Parental control is available on this website which can be accessed only after entering the credentials. The users can easily navigate the most favourite games, best of the new games, new games and other categories. The distinguishing of the games in this website is made easy. Y8 is running as one of the top and popular website with 637 as the Alexa rank throughout the world. The number of users visit the Y8.com website for each month is approximately 53.20 million. The primary source for this heavy traffic is generated mostly from the direct users. So now what you are waiting for playing any game on the Y8.com, which is the biggest collection to play in the online which supports different software like Flash, 3D, HTML5, Java and other shockwave games, etc. POGO is the top and best website for gaming. It let the users play the games in online. Puzzle games, board games, card games, word, casino, arcade, etc. All these different types of games are played on the POGO. The users can play the games on the online by logging on the website without the registration. This website is best for the kids and teens with the limited age. With the best and top games, POGO is different from the other websites. POGO holds 1003 as the Alexa Rank in the global and more than 12 Million monthly visitors visit this website. POGO is the top and most popular gaming website in the year 2016. PLARIUM is the top and popular gaming website globally. PLARIUM.com is mainly specialised in the browser gaming and browser games. Over 1000 employees, the company studios located across the world at USA, UK, Israel, Russia and Ukraine. The website contains more than 250 million users across 150 countries. PLARIUM is the top and popular gaming website which has 1163 as the Alexa Rank in the world and every month more than 71 Million users visit the website for playing these amazing games at PLARIUM. MINICLIP is the best platform for the online gaming and it is the top and most popular gaming website. In this leading online games site, where you can play a huge range of free online games including action games, mobile games, iPhone games, Android games, Windows Phone, games for kids, flash games, sports games, puzzle games, games for girls and much more. MINICLIP holds 1233 as the Alexa rank in the global or across the world. MINICLIP acquires the ztraffic of 33.20 million users every month. The user visit to the MINICLIP website is increasing every month. Are you looking for the fantastic online games? Then you have to check the A10.com for sure. This A10.com has the awesome free online games for you. Now enjoy the action, racing and multi-player games in the online. Now check the user estimated traffic and the rankings for the A10.com website. A10 is the best and most popular gaming website in the year 2016. A10 have the Alexa rank 1412 throughout the global and the estimated monthly visitors of about 23.20 million. This is the real number for this popular and reputed gaming website. The most of the visitors to this website is navigated from Russian and the South American countries. ARMORGAMES is the best and most popular gaming website in the year 2016. Earlier ARMORGAMES had another name called Games of Gondor. This is the real change indeed much needed an alternate name. The website has the games like Hob the Hobbit and Orc Slayer, Armor games now available to play in the online. The users have to register on the website with the valid email ID and once they login they can enjoy the games on the site. This website also supports the social websites integration; you can log in with your Facebook, Gmail Accounts. ARMORGAMES holds the Alexa rank of 2,900 in the global position. The traffic of the users who visit the website monthly is nearly 18 million users to this website. BIGFISHGAMES is one of the best and most popular gaming website in the year 2016. The game founded in the year 2002 and this is the world’s largest distributor and producer of the casual games and delivering the fun to the millions of the people across the world. The games on the website are available in the mobile and online browser for the easy access to the games. Big Fish has distributed more than 2.5 billion games to customers in 150 countries from a growing catalogue of 450+ unique mobile games and 3,500+ unique PC games. BIGFISHGAMES is available to iPad, iPhone, Android, PC and MAC. BIG FISHGAMES holds 2457 as the Alexa global rank across the world. BIGFISHGAMES carries the traffic of 9.5 million monthly active users on this website.